Objective: The introduction of new services in a rehabilitation center is a unique opportunity to introduce a new model of care and services between two institutions. A hospital and a rehabilitation center experienced a clinical management model inspired by an American approach – collaborative care. The purpose of this study was to describe the implementation of this approach and to provide a perception of the quality of care and services provided to patients with moderate or severe traumatic brain injury and to their caregivers. Materials and methods: In this qualitative study, individual semistructured interviews were conducted with patients and their caregivers in the hospital and rehabilitation center where the patients were treated. Individual semistructured interviews were conducted with administrators, and two focus groups were held with clinicians before and after the implementation. Results and conclusion: Ten days’ waiting time were saved with the collaborative approach. Implementing the collaborative care approach has been found to have several benefits, including improved communication, coordination of services between institutions, and better preparation, awareness, and involvement of patients and their families. Administrators, clinicians, patients, and caregivers expressed their opinions on the organization of care and services, the needs and expectations of patients and their caregivers, their participation in terms of roles and responsibilities, their perception of continuity of care, their satisfaction with the care process, and their suggestions for improvements. Rehabilitation services and professional resources are heavily mobilized by patients with a traumatic brain injury (PTBI). According to a report on severe trauma in Canada, in 2010–2011 there were 15,190 people with serious brain injuries, of which 77% were due to an accidental fall or a collision involving a motor vehicle.1 According to data on the website of the Regroupement des Associations de Personnes Traumatisées Craniocérébrales du Québec, each year some 13,000 people suffer a TBI in Québec alone.2 Of this number, nearly 3,000 require hospitalization, with an average hospital stay of 16 days.1,2 As reported by McGarry et al, the cost of such hospitalization is high, estimated at US$8,189 for 6.7 days in hospital for a moderate TBI and $16,788 for 10.2 days for a severe TBI.3 These data do not include posthospital rehabilitation, which can average 23 days at a cost of around $46,000. Brain-injury cases put a high demand on professional resources, hospitals, and rehabilitation services. Recently, a rehabilitation center (RC) and a university hospital center (UHC) set out to improve quality of care and services provided in trauma units. The two institutions found that different factors were compromising the quality and efficiency of care delivery. For example, each facility operated independently, resulting in a fragmentation of services and patients’ needs that had a direct impact on the rehabilitation process. Though each institution was expected to provide a continuum of care and services, both observed that they were unable to meet the needs of their patients in a timely fashion. Because the health care system is organized in silos, the lack of coordination in service provision had a direct impact on PTBI.4 With emergency departments overloaded, PTBI occupy hospital beds (at an average cost of $1,000 per day) while waiting for a place in a rehabilitation unit. The CC approach is defined as the “coordinated application of a process of clinical management, centered on the quality of clinical results, assessed by the comprehensiveness and the particularity of the people living the experience of health, in a context of interdisciplinary and interprofessional collaboration”.7 It involves multiple organizations and partners, and attempts to coordinate all systems related to a given client’s care episode, while eliminating any repetitive, redundant, expensive, contradictory, or inadequate measures. Focused more on the client and caregiver, the approach facilitates collaborative work between all of the various partners involved. Clinicians work together to ensure that clients and caregivers are included in decision making, and to maintain the continuity of care and services between different partners and institutions. These aims require recognition of the competence of each professional and partners involved, which in turn develops collaboration, cohesion, alliances, and mutual assistance between everyone providing care and services. Lastly, the CC approach is an innovative management model that allows the quality of care to be measured, taking into account the close connection between on the one hand organizational structure and the communication process and on the other hand outcomes.8 The CC approach was implemented in both facilities in 2008 for patients admitted with a moderate or severe TBI (Glasgow Coma Scale score ranging from 3 to 12). The main objective of this study was to describe whether applying the CC approach yielded good quality care and services provided to PTBI and their caregivers from the hospital to the rehabilitation center, as perceived by the hospital administrators, clinicians, patients themselves, and their caregivers. The project was approved by the UHC’s Health Research Ethics Committee and the RC’s Research Ethics Committee. Prior to any participant’s involvement, the research team explained the aims and procedures involved in the study, and participants agreed to participate by signing a consent form. At baseline, the two institutions involved had a service relationship that referred to working in silos. The acute care setting was referring the PTBI to the rehabilitation setting when the medical condition was considered stable by physicians. At that moment, if a bed was available in the rehabilitation setting, then the transfer took place. Communication was limited to paper between the liaison nurses. Families were not always involved in the process, nor were patients included in the care plan discussion having the patient or the caregiver as a decision maker. Four groups of stakeholders were defined and recruited using a nonprobabilistic sampling strategy. Convenience sampling was used to recruit administrators and clinicians from both the UHC and the RC to populate the first and second groups, respectively. All administrators and clinicians had to be involved with the target PTBI and represent different disciplines or professions. PTBI recruitment was accomplished with the help of the UHC clinical coordinator and the clinical trauma nurse. They were asked to refer to us, after admission to intensive care, any patients with moderate or severe TBI whose rehabilitation was to take place at the UHC and the RC. On receiving a referral, the research assistant met the patient and caregiver to present the research project, obtain their consent, and schedule the first interview. Purposive sampling was used to generate the third group, which consisted of patients over 18 years of age who had suffered a moderate or severe TBI and had agreed to participate. These patients received care and services at the UHC, followed by inpatient or outpatient services from the RC. The fourth group consisted of these patients’ caregivers. All participants in both these groups had to be able to speak and understand French or English and live within a 100 km radius of the UHC or RC. Guides for the semistructured interviews and focus groups, constructed following Morgan and Krueger’s methodology, were used for collecting data from the four groups.9 All questions pertained to study objectives by addressing the quality of care and services provided and the level of satisfaction with the CC approach, specifically the organization of care in the context of post-PTBI rehabilitation, the needs and expectations of all stakeholders (administrators, clinicians, patients, caregivers), the participation of these stakeholders in terms of involvement and responsibilities, the perception of continuity of care, and the satisfaction level of clinicians and administrators regarding the care process before and after implementation of CC. The same questions were asked of all stakeholders. Two semistructured interviews and two focus groups were conducted with the administrators and clinicians from UHC and RC, respectively. Each pair of interviews and focus groups was separated by an interval of 1 year. Individual semistructured interviews of about 45 minutes were conducted with the patients and their caregivers. The interviews took place at two points: while patients were hospitalized at the UHC and after their return home, 1 month after leaving the RC’s rehabilitation unit. All discussions were recorded on audiotape and transcribed verbatim for coding and analysis. Notes taken during the focus groups were also used as a data source. Qualitative content analysis served to generate themes and classify the responses into categories. The frequency of recurrence of each theme was taken into account. These categories were compared to potential categories drawn from a literature review. To categorize and structure the analysis, we followed the steps proposed by Guba and Lincoln for a constructivist evaluation.10 Qualitative data from the interviews and focus groups were coded using NVivo 7 software (QSR International, Melbourne, Australia).11 In order to ensure the validity of the results, data were triangulated by two research assistants and verified randomly by the researchers. The clinicians chosen for the focus groups (four from the UHC, ten from the RC) represented several disciplines, including occupational therapy, physiotherapy, social work, neuropsychology, nursing, and medicine. Six administrators were interviewed individually, three from each institution. 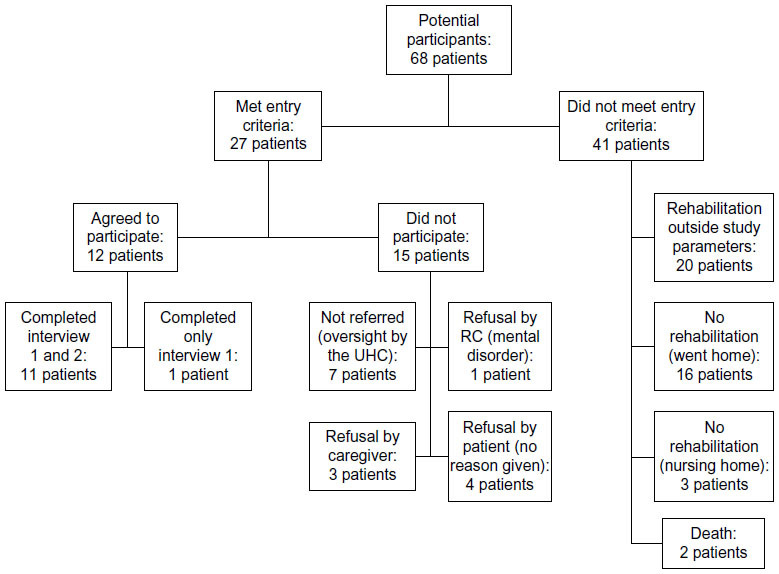 In total, there were 68 patients with recruitment potential, but only 27 met the study criteria. Of those, 12 patients agreed to participate in the study, though only eleven completed both interviews. Figure 1 provides a summary of recruitment efforts and reasons for exclusion from the study. Abbreviations: UHC, university hospital center; RC, rehabilitation center. Characteristics of PTBI participants (n=11, 63.6%) were men aged 40.7±18.3 years, a little over half of whom had suffered a severe TBI. Road accidents were the most common cause for the injury. Nine patients had a caregiver aged 23–70 years (average 50.7 years) that agreed to participate in the study. Most of the caregivers were women (88.9%), and 45.5% were a parent of the patient. Please see Table 1. Themes identified in the interviews and focus groups are presented in the following sections. For the clinicians, patient management was done through evaluation and follow-up, intervening to inform the patient of how his condition was evolving. In summary, while the clinicians wanted to transfer patients as quickly as possible from the UHC to the RC, their families were not always prepared for the transfer or given adequate advanced notice. Interviewer: When you say that you or your loved one get good care and services, what do you mean? In our analysis of the qualitative data, we found that the clinicians were focused on the patients’ needs, which were to regain a similar degree of autonomy to what they had before their accident. They were also aware that the families wanted to contribute. In all the interviews, we found that two stakeholders were actively involved with the patient and the patient’s family. Clinicians have disciplinary involvement, one to one with the patient or family, but there was no evidence of interdisciplinary collaboration in patient-centered group meetings or rehabilitation plans involving all stakeholders with reference to the patient’s or family’s needs, having the patient or the caregiver present as a decision maker. The perception of the intervention team was that interprofessional intervention between sites did not occur. According to the administrators and clinicians, the clinical care pathways to assure continuity of care worked out for CC were little used and needed to be reviewed because the process was too unwieldy. Nevertheless, they reported that CC contributed to better communication, helped avoid repeating assessments, gave fluidity and coordination to services between the two institutions, and fostered a change in ways of thinking. One thing they were especially proud of was the reduction in waiting times for patients to be transferred from the UHC to the RC. The average waiting time fell from 15–20 days to 0–2 days. Most of the patients and their caregivers noticed that there was no waiting period before the transfer from the UHC to the RC, and felt there was good coordination and continuity of care from one institution to the other. It is important to note that all stakeholders agreed that the patients received good care, at the right time, from the right person, and in the right place. Regarding most of the care and services received, the patients and caregivers were highly satisfied, going so far as to rate them ten out of ten. There was some dissatisfaction with elements externals to CC, such as the quality of meals, difficulties with the nursing staff, and the unavailability of some physicians in private clinics. It should be noted that one caregiver reported that the timetable for meetings with RC clinicians conflicted with his job. Another hinted that physicians at the RC were not always available. Administrators and clinicians suggested revising the clinical pathways, meeting more frequently with patients and especially caregivers, eliminating the step of going through the physiatrist for discharge from the UHC (redundant, stretches out the hospital stay), involving nursing staff more, and extending CC to other clienteles. Therefore, there are still improvements to be made in patient transfer and teamwork. For patients and caregivers, it is important to improve the organization of care and services generally, and to have better access to care and physicians. It is also important to improve relational aspects like communication, listening, information, and support. The purpose of this study was to describe the implementation of CC and to provide a perception of the quality of care and services for TBI patients. The CC approach requires that every stakeholder be involved with every care episode. As noted by Cope et al, optimal rehabilitation of PTBI requires coordination between the acute care provided in hospitals and the type of care offered in rehabilitation centres.12 The CC approach was designed to bridge the gap between institutions that provide care to PTBI and optimizing rehabilitation by reducing the transfer time. Reducing the transfer time to 1 day is a sign of efficient care. Both institutions in our study focused on a patient’s physical needs with regard to improving their state of health. Few studies have looked at the needs of PTBI during hospitalization, despite findings that change depends on the circumstances of the rehabilitation process.14 As for the needs of caregivers, they were like those in studies published in the literature on the needs of families with a relative in critical care.17–23 These articles demonstrate the importance placed by families on being informed of the loved one’s state of health. There are limitations in our study, including the small number of patients available for recruitment. This can be explained by a regional reorganization of patient distribution that took place during the study period, resulting in fewer patients being sent to the institutions included in the study. In addition to this, a number of patients in our target population received rehabilitation care outside the region and were thus not included in our study. The implementation of the CC approach at our institution yielded favorable results in terms of the quality of care and services provided to PTBI, as perceived by the patients themselves, their caregivers, clinicians, and hospital administrators. Patients reported being satisfied with the care and services they received, while clinicians and administrators reported improvements in transfer times between institutions as well as better coordination of care between the hospital and rehabilitation center. The authors wish to thank the Fonds de recherche Québécois en santé for its financial support, and the patients, caregivers, clinicians, and administrators for their time and wise suggestions. Many thanks to Jennifer Chambers for her excellent suggestions during the scientific review. Canadian Institute for Health Information (CIHI). National Trauma Registry Report 2013: Hospitalization for a Major Injury in Canada, 2010–2011 Data. Ottawa: CIHI; 2013. Regroupement des Associations de Personnes Traumatisées Craniocérébrales du Québec. Le TCC, c’est quoi? [Traumatic brain injury association of Québec. What is brain injury?]. 2013. Available from: http://www.raptccq.com/fr/raptccq/le-tcc-cest-quoi.html. Accessed January 13, 2012. French. McGarry LJ, Thompson D, Millham FH, et al. Outcomes and costs of acute treatment of traumatic brain injury. J Trauma. 2002;53:1152–1159. Lefebvre H, Pelchat D, Héroux M. Partenariat familles, professionnels, gestionnaires: vers une continuité de soins et services [Family, professionals and managers partnership: towards continuity of care and services]. Ruptures (Univ Montr Groupe Rech Interdiscip Sante). 2003;9:127–146. French. Cohen JJ. Collaborative care: a new model for a new century. J Med Educ. 2000;75:107–112. Régie Régionale de la Santé et des Services Sociaux Estrie. Direction de la Santé Publique et de l’Evaluation [Regional center for Health and social services in Eastern Townships, Direction of Public Health]. 2001. French. Zander K. Managing Outcomes Through Collaborative Care: The Application of Caremapping and Case Management. Chicago: American Hospital Association; 1995. Donabedian A. The quality of care. How can it be assessed? JAMA. 1988;260:1743–1748. Morgan DL, Krueger RA. Analysing and Reporting Focus Group Results (Focus Group Kit). London: Sage; 1998. Guba EG, Lincoln YS. Fourth Generation Evaluation. Newbury Park (CA): Sage; 1989. QSR International. NVivo qualitative data analysis software. Version 7. Melbourne: QSR; 2006. Cope DN, Mayer NH, Cervelli L. Development of systems of care for persons with traumatic brain injury. J Head Trauma Rehabil. 2005;20:128–142. Lefebvre H, Pelchat D, Swaine B, Gélinas I, Levert MJ. The experiences of individuals with a traumatic brain injury, families, physicians and health professionals regarding care provided throughout the continuum. Brain Injury. 2005;19:585–597. Rotondi AJ, Sinkule J, Balzer K, Harris J, Moldovan R. A qualitative needs assessment of persons who have experienced traumatic brain injury and their primary family caregivers. J Head Trauma Rehabil. 2007;22:14–25. Chua KSG, Ng YS, Yap SM, Bok C. A brief review of traumatic brain injury rehabilitation. Ann Acad Med Singapore. 2007;36:31–42. Khan F, Baguley IJ, Cameron ID. Rehabilitation after traumatic brain injury. Med J Aust. 2003;178:290–295. Alvarez GF, Kirby AS. The perspective of families of the critically ill patient: their needs. Curr Opin Crit Care. 2006;12:614–618. Auerbach SM, Kiesler DJ, Wartella J, Rausch S, Ward KR, Ivatury R. Optimism, satisfaction with needs met, interpersonal perceptions of the healthcare team, and emotional distress in patients’ family members during critical care hospitalization. Am J Crit Care. 2005;14:202–210. Bond E, Draeger CR, Mandleco B, Donnelly M. Needs of family members of patients with severe traumatic brain injury: implications for evidence-based practice. Crit Care Nurs. 2003;23:63–72. O’Callaghan AM, McAllister L, Wilson L. Experiences of care: perspectives of carers of adults with traumatic brain injury. Int J Speech Lang Pathol. 2011;13:218–226. Sinnakaruppan I, Williams DM. Family carers and the adult head-injured: a critical review of carers’ needs. Brain Injury. 2001;15:653–672. Stebbins P, Leung P. Changing family needs after brain injury. J Rehabil. 1998;4:15–22. Van der Merwe J. Family Needs Following Adult Traumatic Brain Injury [master’s thesis]. Port Elizabeth, South Africa: University of Port Elizabeth; 2004. Azoulay E, Pochard F, Chevret S, et al. Half the family members of intensive care unit patients do not want to share in the decision-making process: a study in 78 French intensive care units. Crit Care Med. 2004;32:1832–1838. Vitaz TW, McIlvoy L, Raque GH, Spain D, Shields CB. Development and implementation of a clinical pathway for severe traumatic brain injury. J Trauma. 2001;51:369–375. Bergeson SC, Dean JD. A systems approach to patient-centered care. JAMA. 2006;296:2848–2851. McKay CA, Crippen L. Collaboration through clinical integration. Nurs Admin Q. 2008;32:109–116. Sirois M, Lavoie A, Dionne CE. Impact of transfer delays to rehabilitation in patients with severe trauma. Arch Phys Med Rehabil. 2004;85:184–191. Henrich NJ, Dodek P, Heyland D, et al. Qualitative analysis of an intensive care unit family satisfaction survey. Crit Care Med. 2011;39:1000–1005. Heyland DK, Rocker GM, Dodek PM, et al. 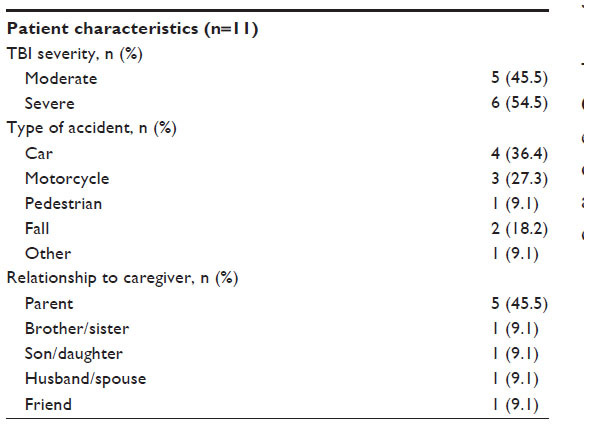 Family satisfaction with care in the intensive care unit: results of a multiple center study. Crit Care Med. 2002;30:1413–1418.